Negative amortization is a financial term, which you may also encounter as NegAm, deferred interest, or graduated payment mortgage. To understand how negative amortization works, first you need to understand how to define amortization. This is the process of decreasing a specific amount or accounting for it, within a specific period of time. It follows logically from this that negative amortization represents increasing the principal of a loan, as the payments made to cover that loan don’t cover its interest. Whatever interest payments remain outstanding are added to the principal of that loan. As such, at the end of the day, the borrower ends up owing the lender more money. This information is provided mainly for general education because in practical terms, chances of you actually running into this type of mortgage are very low. They were very popular several years ago but because of their complex nature, misuse and lack of supervision of the lenders, a lot of borrowers were steered towards them without having the full understanding of the risks involved. The only place where NegAm mortgages still exist is the Reverse Mortgage space. How do negative amortization mortgages work? Here’s an example of how negative amortization works. Say you take out a loan with a $500 monthly interest payment. If you agree on this with the lender from the get-go, via contract, you might be able to pay only $400 per month in interest. The remaining $100 is added to the principal balance of your loan. 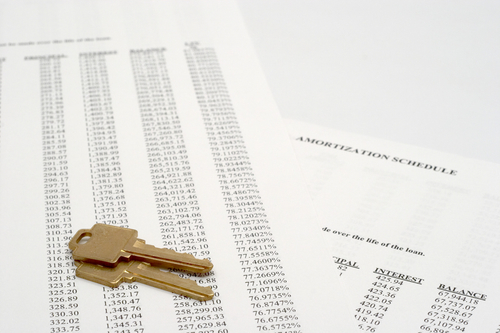 There are several negative amortization loan types. When they’re adjustable rate mortgages, they are typically called payment option ARMs. When they are mortgages with a fixed rate, they’re called graduated payment mortgages. The advantage for taking out such a mortgage loan is that, for a brief while, you’ll be able to make smaller monthly payments. However, at a certain point these payments will need to increase by a large extent. These payment increase dates are established by the borrower and the lender beforehand, both for graduated payment mortgages, as well as for payment option ARMs. They are laid out in an interest only amortization schedule – however, make note that payment option ARMs can come with payment shock risks, since they can sometimes trigger a recast of the mortgage before a scheduled payment increase. Before you decide whether or not negative amortization can work in your favor, we advise you to check out a reverse amortization calculator. In some cases, it might help you to make lower monthly payments in the beginning of your loan’s repayment period; in others, however, it will only cause you to pay more interest. Though the main process is largely the same for student loan amortization as for negative amortization on any other type of loans, there’s a slight difference in how this amortization occurs. When you make a payment on your student loan every month, a part of that payment covers the interest, while the rest covers the principal. For college loans you pay more interest at the beginning of the loan’s repayment period than at the end. In time, you end up paying less interest and more principal, since your loan has been largely amortized. However, the longer the lifespan of your loan, the slower it will amortize. This means you get to pay less each month, but also risk carrying over more interest during the duration of the loan. This type of repayment method can help you out early on in your career, when you’re not making so much money. However, as time progresses and you are better off financially, we recommend that you check out your student loan balance and strive to pay more of the principal. Thus, you’ll be effectively shortening the lifespan of the loan and pay less in interest.